It’s not unusual to find out that your iGen teen is scarcely ever far away from her/his cell phone. Many sleep with it under their pillow or on a nightstand close by. A teen named “Molly” said in an interview that it brings her comfort to have her cell phone close by when she is sleeping. Jean Twenge writes that “…sometime around 2011 we arrived at the day when we looked up, maybe from our own phones, and realized that everyone around us had a phone in his or her hands.” Truly, cell phones are everywhere – nearly 300 million phones in use in the US. More stunning than that statistic is the one showing how many hours a day iGen teens are spending on their cell phones: 2.25 hours texting, 2 hours on the Internet, 1.5 hours gaming, and 0.5 hours video chatting. 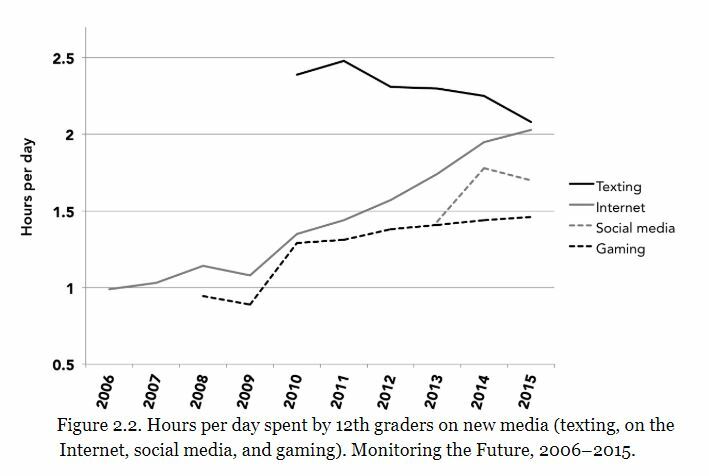 Add to that the 17 hours a day that teens spend in school, sleeping, and homework and other school activities, and it becomes clear that nearly all of the their remaining leisure time is spent with the new media and their cell phones. The fact that reading books is in decline is no surprise. Twenge hypothesizes that it is because books aren’t “fast enough.” iGens click at lightening speed from one app to another and from one text message to another. It’s hard to keep the interest of someone who is absolutely distracted by social media. When NPR asked DC 9th grader Jamahri Sydnor if she ever reads, she said, “I don’t really read for pleasure…I watch Netflix shows, or Hulu shows, mostly TV. That’s it.” iGens also say they prefer not to go out to movie theaters because it’s easier to stay home in your pajamas. What’s a parent to do? Clearly, parents want their children to grow up to be intelligent, curious, and engaging-with-the-world. But the social media world of cell phones produces the opposite. Twenge says that “critical thinking scores have followed reading scores – both in decline. Raise your children in a reading environment. Read to them and let them see you reading. There’s no shortcut to this. Postpone the time when you allow your child to have a phone, and limit the amount of time they have to use it. Encourage healthy social engagement through sports, belonging to clubs, and other ways of interacting with people rather than a phone. And., expose your children to experiences that will raise their curiosity: museums, civic involvement, participation in church in an enlightened way, and family dinner time where a variety of subjects get discussed. Make no taboos for dinner discussion; it is an opportunity to teach critical thinking.